I have just found your site while searching for grommets for the bulkhead of a 109 Land Rover Safari that I am doing a total rebuild on. I spent my working life in coal mining, starting as a haulage lad, then progressing to a hand filled coal face, shotfiring, deputy, overman and undermanager. For a while I was captain of Highley No3 Mines Rescue Team where I was a deputy, before being transferred to another pit. I was involved in the last big fire at Baggeridge Colliery, in South Staffordshire, which temporarily closed the mine, (and that might make an interesting story one day) and again at Granville Colliery, Shropshire, a very gassy mine, in which the fire set off several explosions. A very interesting time! I finished my time at Littleton and Lea Hall Pits, both big pits on Cannock Chase. I still regularly see Alex Cox, who was under manager at Madeley Wood at that period, he keeps in touch with a number of people from Madeley. If there is any information that I can help you with, just ask. You have a picture of the Rescue Team from Babbington Colliery. The miner on the right seated, is John Thomas Rigley. He was a pit deputy and my Grandfather. I know in one of the rescues he made, one of the miners lost an arm; it was reported in the Evening Post but I don't have a copy. If anyone has any information I would like to know. He was born in 1871, and died in 1954. As far as I know he was a miner all his life. I suppose he was one of the few to reach the age of 73. I am very proud of the fact he was a miner doing a very dangerous job, but I would like to know more about him. His father Robert Rigley was also a miner and is down as an Engine Driver on his Marriage Certificate in 1871. 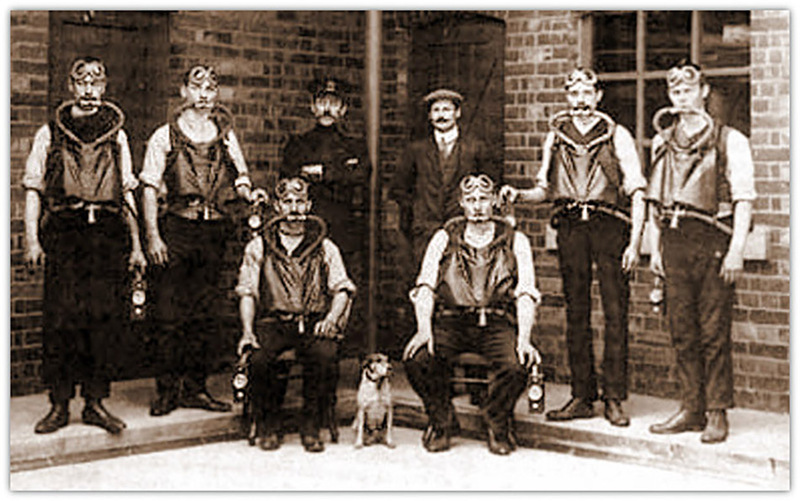 Babbington colliery No 1 Rescue Team (c. 1911 ) on one of their training days at Mansfield Woodhouse Rescue Station. John Thomas Rigley is seated on the right. I don't know which pit he worked at. He was born in Nuttal in 1851. Roberts brother was William Rigley who I think owned the Waggon Works at Bulwell. I have traced two more generations of Rigley miners Roberts father was Thomas Rigley Born 1826, and his father was another Robert Rigley born in Ilkeston in 1800. My Mother is currently pursuing a damages claim against the coal board for my Grandfather's death. He worked in various Staffordshire mines between 1919 and 1953. The coal board is claiming they have no records of his employment and my Mother's solicitor has mailed her to request proof of her Father's occupation or alternatively his National Insurance number. She can not provide either and her Birth Certificate is a duplicate and fails to show Fathers occupation. Where can she obtain his N.I. no. or proof of his years of employment? I was also in the mines rescue and attended the incident at Granville Colliery that Alf Powick mentions. Is there any way I can get in touch with him?